Innkeepers Jim and Chris Farr invite you to their lovingly restored 18th-century fieldstone mansion for an unforgettable bed and breakfast experience in the heart of Pennsylvania’s Dutch Country. Listed on the National Register of Historic places, this handsome fieldstone mansion is located on Churchtown’s quiet Main Street among school houses, churches, Colonial cemeteries, and genial neighbors. Picturesque rolling hills and farmlands, the sounds of horse-drawn Amish buggies, and the scents of surrounding farm country impart a serene sensory experience for a perfect getaway in Lancaster County, PA. Come to the Inn for a little bit of romance or relaxation, take part in one of our Murder Mystery Weekends or other special events, or simply come to explore the area’s activities and learn more about our Country’s history in nearby Philadelphia and historic locations. Nine unique guestrooms offer historic charm with modern-day amenities, large, cozy beds with luxurious linens and Lancaster County Amish quilts. Each immaculate room boasts a private bath, antique furnishings, air-conditioning, televisions, and some have fireplaces for the colder seasons. Cottages are also available for a more private retreat, and dogs are welcome in both.The scent of freshly brewed coffee beckons guests to the glass-enclosed garden room for an award-winning four-course breakfast each morning and to enjoy views of the mature gardens, the murmur of the waterfall pond, sweeping views of the Amish and Mennonite farmlands, and chatting with the other guests. Jana Leigh Sheaffer has been in the spa industry for over 25 years. Jana has worked for such luxury spas as Salamander Resort and Spa and The Chocolate Spa at Hotel Hershey. She welcomes you to come and experience ultimate pampering at the Churchtown Inn. Enjoy Swedish, therapeutic, or deep tissue massage from the convenience of your own room. Please call us if the following times do not work for you. We may be able to accommodate your schedule. SEMI-ANNUAL UNIQUE OPPORTUNITY TO EXPLORE AREAS OF LANCASTER COUNTY YOU’VE NEVER DISCOVERED BEFORE. Tour Hours are Mon thru Sat from 9-5 Restaurants, cafes & wineries will hold the hours posted in the guide booklet. Thirteen businesses will also offer Sunday hours (All hours are noted in your tour guide booklet). NOW FOR THE GOOD NEWS…YOUR TOUR BAG IS OUR GIFT TO YOU! This year’s April tour has some new attractions! 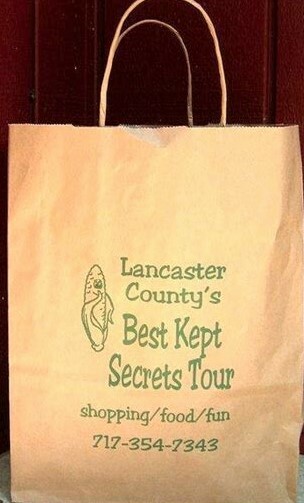 As always, stay two nights and get your $10 bag and possibly a tour guide for free.